Chris Wimpress, Weeks in Naviras. Self-published, 2013. Pp. 255. ISBN 978-1-31079-670-8. $2.99. Ellie Weeks, the main protagonist in Chris Wimpress’ Weeks in Naviras is killed in a terrorist attack. However, shortly afterwards she wakes to find herself in a unique afterlife based on her experiences of Naviras, a quiet Portuguese fishing village which she had fallen in love with many years before. The story is split into two narratives which generally alternate with each chapter. It begins with Ellie’s afterlife experience but then also provides the background of her life and how she came to be killed. The book is well-structured with this evocative trick that keeps you reading, even in the more pedestrian sections of the narrative where you’re not quite sure what the story is driving towards. In the environment of her afterlife Ellie explores a foggy, skewed Naviras, discovering a rich but confusing geography with periodical recollections and blurred images of her life which often lack clarity to both herself and the reader. This gives these portions of the book a kind of curious surrealness that, with the authors use of language and imagery, come across as dream-like and fluid. In contrast the background chapters, where Ellie describes her life and explains her progression towards death, are clearer to follow. Ellie is an intelligent, middle class young woman who meets her future husband—James—while holidaying in Naviras with her friend Gail. Ellie’s and James’s relationship progresses quickly against the backdrop of politician James’s equally advancing career. It does not seem long in narrative terms before they are married, have children and James has become Prime Minister. While this subsequently brings the story to explain why Ellie died, it then explores the fragile nature of her afterlife, which seems to unravel around her as she delves deeper and deeper into it. Things are not how they should be and Ellie’s inquisitiveness leads her to some startling and conspiratorial discoveries later in the book. While I felt there were times where the narrative itself was quite slow, you are consistently left wondering what is going on—while it would be easy to dismiss some of the text as a kind of watery middle-class holiday diary (albeit with a very supernatural twist)—something really bites you as a reader and your curiosity cannot help but grow with each page. Time in Weeks in Naviras is often fragmented and moves deceptively fast, never staying still or in one period for very long. This requires concentration to follow and it’s not a book that is either easy to pick up or put down. Ellie is a good narrator and her complex relationships with her fellow characters are well described and believable. Hotel-owner Lottie is a wonderfully warm and maternal character while James, as a Conservative MP, is every bit the neglectful and distant career politician. It’s perhaps difficult to pigeonhole Weeks in Naviras in terms of genre. As mentioned, some of it reads like a holiday journal—fluffy and whimsical in its description, profoundly middle-class and more than a little shallow at times. However, it’s actually so much more than that. 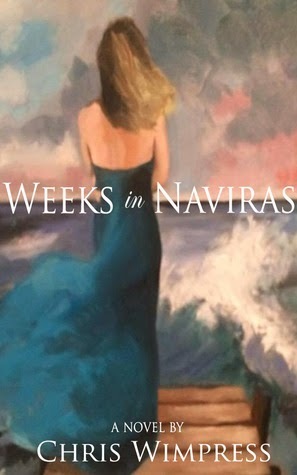 Weeks in Naviras blends both sci-fi and supernatural elements, along with a conspiratorial and abstract form of whodunit. You also have the reflective personal struggles of Ellie herself, which are key to the storyline and provide her character with a rounded believability which engages the reader throughout. Weeks in Naviras is unpredictably different and, while there are a few places where things become a little too remote to follow clearly, it stays with you after you finish reading. This is principally down to the strength of the characters and the inquisitiveness the reader gleans from Ellie herself. In many ways it is an exploration of Ellie’s psyche and, with the tapestry of events which unfold, this creates a unique and engaging plot that is both thoughtful and evocative. It is an enjoyable read overall and is definitely recommended.